When I was last back in Germany, earlier this year, I had an idea. I've spent quite a bit of time in Germany over the last 20 years or so, and then lived there for over a year. 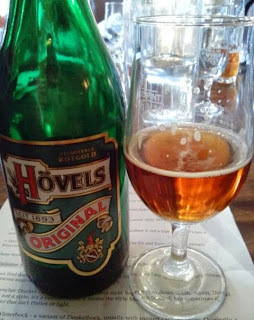 I quite quickly got bored of Pils and Helles, so I started looking for something more interesting, and in the process I learnt quite a bit about the beer heritage that most Germans have forgotten. For instance, German beer being blond lager is relatively recent, about 100 years old. If you go back to the mid-1800s, it was mostly an ale country, and even the lager was brown. You can't see it on the surface now, but it's still there when you look deeper – the imposition of the alien Reinheitsgebot did a lot of damage to traditional ale culture, but some survived. I couldn't get everything I wanted, but I found good alternatives for pretty much everything, and then a few weeks ago I finally got off my arse and booked a venue – the swish mezzanine at the very friendly (and excellently beery) Kew Gardens Hotel. Needless to say, several of those I invited were out of the country, working or otherwise unavailable, but in the end eight of us sat down to enjoy some German beer that you can't usually get outside its area of origin. This is an ur-Weisse (original-style Weisse), intended to be like the 18th century Bavarian Weizen before pale malt (an English innovation, by the way) was introduced. Brown rather than gold, and faintly smoky, with caramel and fruit notes, and just a hint of winey sourness. A Franconian braunbier (brown beer), this is the historic style of Franconia – most country breweries still make one. They are bottom-fermented now, but must once have been ales, I guess. Nutty and spicy, with a little toffee and bread. A lightly smoky country-style brown beer. Landbier is not a type of beer, it's just a qualifier, like “traditional” or “real”. Sweetish and malty, with touches of plum and a dry-bitter finish. Akin to Alt and formerly called Hövels Bitterbier, this really is a rather nice German brown bitter! Earthy and hoppy, with slight roasty notes. Only as I unpacked did I realise I'd actually included not two but three brown bitters. Yes, once upon a time Germany, like England, was a country of brown bitter beers. The Einheitsgebot (German joke – it means Law of Sameness) and the ensuing lager flood murdered many of them, but a few survive in pockets in various parts of Germany. You can find dark beers in most of Germany. As with the pale lagers, they have tended to verge towards their Bavarian equivalent, which is Munich Dunkel, but not always. A classic East German black beer. Tends to be quite roasty – this one has hints of coffee and plum, some roasty malt and burnt caramel, plus a light bitterness and a faintly salty and ashy finish. Again, Dunkel by itself is not a style, it's a shade or range of shades – often it means the style Munich Dunkel, but sometimes it's simply a beer that isn't Helles or light. Originally a North German strong ale, Bock was adopted and converted to lager brewing by the Bavarians. Winterbock is a variant of Dunkelbock, usually with toasted caramel notes, and it seems to be mostly a Northern thing – I wanted one in here both to show off Bock and to show how German brewers have evolved the style a little. 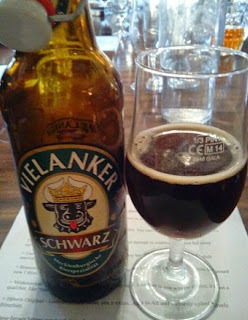 Vielanker's version, from the north-eastern state of Mecklenburg, is toffee-ish with smoky notes, sweetish but with a lightly bitter finish. 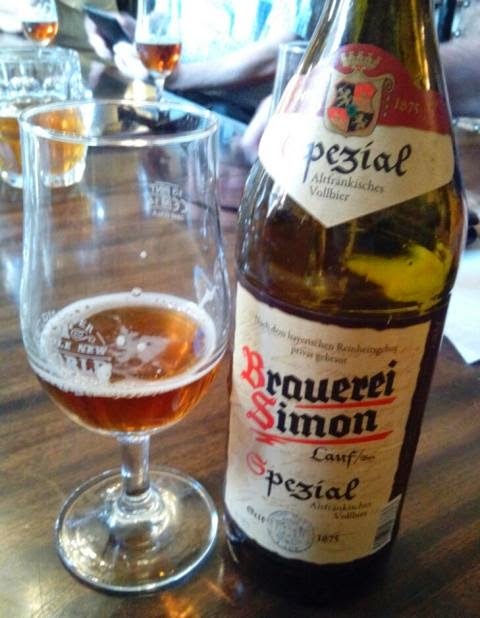 This is listed on Ratebeer as one of the best beers in Germany, and I tend to think they underestimate it... I discovered I had a couple of these in store so I brought them along as an extra, to show what the best Bavarian strong Bocks are like. There's lots of sweet malt and dried fruit in there, plus a roastiness and plenty of alcohol – this is one dangerously drinkable beer! Everyone seemed to enjoy the evening, and the beers went very well. While I might well choose a different mix if doing this again, this one worked well and highlighted just how much more there is to traditional German beer than blond lagers – and of course if you add in the modern craft movement and the more innovative brewpubs, there is lots more still. Fun, eh?